This idea was originally written by Ken Remsen, a school principal from Vermont, and was based on farming and falling milk prices in 2003. Remsen, K. (2003, July 25). No cow left behind. Burlington Free Press, p. 11A. I adapted Remsen’s original article to fit the context of ranching on the prairies and shared it on the Pine Ridge Reservation in August 2007. Recently, on Facebook (2.23.15) I posted the following image. The responses I received made me think of No Cow Left Behind. Please note the dates: 2003 to 2007 to a new update 2015. When this struggle began in the late 1990s, I had no idea that kids and teachers would still be suffering under this top-down, corporate approach to teaching and learning in 2015. A bit more history: As a nation, we followed the guidelines of ESEA (Elementary and Secondary Education Act) for decades; in the early 1990s, we began operating schools under NCLB (No Child Left Behind), which morphed into RTTT (Race To The Top) in the early 2000s. In my view, RTTT is simply a louder, meaner, tougher, harder version of NCLB. 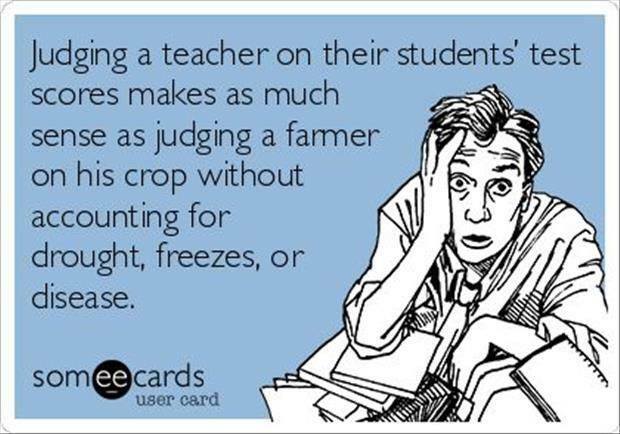 And, now, as a nation, we are crazed with measuring and blaming kids and teachers. Since many assume that testing is the cornerstone to improving student and teacher performance, I do not understand why this principle isn’t applied to other businesses. For example, if we test cows and ranchers, wouldn’t this be effective in improving their performance, too? Therefore, I propose that the government mandate testing all cows and ranchers. I know that it will take time and cost money, but that should not detract us from what must be done. There are plenty of statistics to show what good cattle performance looks like. It should, therefore, be easy to figure out the characteristics necessary to meet these standards. The testing will begin by finding out which cows (a) exceed the standard; (b) meet the standard, (c) almost meet the standard, or (d) fail to meet the standard. Points will be assigned in each category, and it will be necessary to achieve a certain mandated score. If this score is not achieved, the government will send in experts to give advice for improvement–never mind that these experts have never been to a ranch. If improvements do not occur, punitive measures will begin immediately. The state will take over your herd and your ranch, as they know more about ranching than ranchers. Ranchers believe in hybrid vigor, but it is important to remember that every cow must meet the same standard. Black Baldies have to be just like Texas Longhorns; Herefords have to be just like Angus; Beefmasters have to be like Charolais. All Brown Swiss, Guernseys, and Holsteins must also measure up and be held accountable for producing good beef, even though their family cultural patterns have stressed only milk production. One-size-fits-all is our goal for all cows in the United States. In addition, No Cow Left Behind will not make allowances for new cattle, which the rancher just bought at the sale barn: Just because the previous rancher did not provide the proper nutrition or a proper environment, accountability must be maintained. Another key factor will be the placement of a highly qualified rancher on each ranch. It doesn’t matter that some ranchers have more money and experience than others, it will be necessary for all ranchers to become certified by the same test. It is irrelevant what the ranchers knew before or where they learned it, No Cow Left Behind has new standards for ranching on the prairies. Ranchers will need to begin taking classes at night and during their summers. There will be a bit more paperwork: Accountability, you know. It will also be necessary to allow “choice” for the cows. If cows are not meeting the standard on a certain ranch, they will be allowed to go to the ranch of their choice. Transportation may become an issue, but it is critical that cows be allowed to leave their low performing ranches. This will force low performing ranchers to leave their home ranches and look for minimum pay work in town. This is simply good business! A few cows may become so discouraged that they simply wander off and drop out. This is not a problem, as the remaining cows will bring up the test scores for the nation. A few ranchers may also become too discouraged to stay in the business. This is an opportunity to bring in other, more compliant ranchers. However, the government officials who mandate No Cow Left Behind know better, as they eat beef. No Cow Left Behind is not good for the ranching industry, nor ranchers, and it sure is not good for cows. LOVE it! Oh Joan. You are gonna raise a ruckus with a lot of ranchers, not to mention them cows! Thanks – glad it works for you. I suspect I’ll get some ‘push-back.’ Now, I’m going to go check out your daughter’s blog. I LOVE it!! Do I have your permission to provide a link to your post on my blog? Very clever. Of course, Alicia. Help yourself to anything on my webpages.